Committed to our patients, referring physicians, and the insurance community to offer innovative yet cost effective radiation treatments in an honest, thoughtful, and caring environment. There are several steps to any radiotherapy or radiosurgery treatment. They consist of tumor visualization, treatment planning, treatment delivery, and follow-up. Again, your clinical team will determine which treatment technique is right for you and will be able to answer any questions you may have before, during or after treatment. In order to design your treatment plan, your treatment team will take images to reveal the exact location of the tumor, including its size and position relative to the surrounding tissues and organs. This is typically done with a CT scan. Depending on the general location of the tumor and other factors, additional types of scans may be taken, such as an MRI, a PET scan or an ultrasound scan. 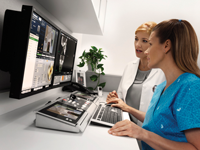 With the help of these scans or imagines, your clinical team can see details of the tumor from a variety of angles. is being treated) will be made, and tiny skin marks may be used to help ensure you’re in exactly the same position for each treatment session. With the completed scans, your clinical team will use sophisticated treatment planning software to develop a three-dimensional “picture” of the area where you will receive treatment. They’ll determine the amount of radiation to be delivered, the appropriate angles from which to deliver it, and the number of sessions needed to deliver the prescribed treatment. They’ll also take into account many other factors—including the type of cancer being treated, its location and size, your medical history, and your lab test results—to create a plan uniquely designed for you. Your cancer treatment will be delivered on a machine called a linear accelerator or linac for short. This machine produces the X-rays used to treat cancer. Before each treatment session, your radiation therapist (RT) will help position you on the linac’s treatment table, or “couch.” Once you are positioned, the therapist may use the machine’s imaging system to take a new image of the tumor in that day’s treatment position to verify the correct target. During the imaging, you will notice motion from the robotic imager arms on each side of the linac as these arms extend and the linac begins to rotate around you. Adjustments to your position may then be made so that it precisely matches the position that was planned for you. The therapist will leave the room before your treatment begins. Your therapist will likely be in constant contact with you, using cameras and microphones set up in the treatment room. During the treatment, you will not see the radiation beam. You may hear the quiet buzz or shuffling of the beam-shaping device located inside the head, or gantry, of the machine. This beam-shaping device is called a multi-leaf collimator (MLC) and it adjusts to create a uniquely shaped opening for the radiation beam to pass through. As the gantry rotates around you to deliver radiation beams from various angles, the MLC continuously adjusts the beam to conform to the shape of the tumor, which helps to deliver accurate treatment. The linac will rotate around you as radiation is administered directly to the tumor. After you complete your treatment, your radiation oncologist and healthcare team will monitor your progress with a series of follow-up visits. These visits can include a physical examination, blood screening, additional imaging, and other tests that may be needed. Your follow-up appointments are also a good opportunity for you and your caregivers to ask any questions about your progress or inquire about the status of your overall health. How is Radiation Used to Fight Cancer?